Estate Quality. Real. Metal. 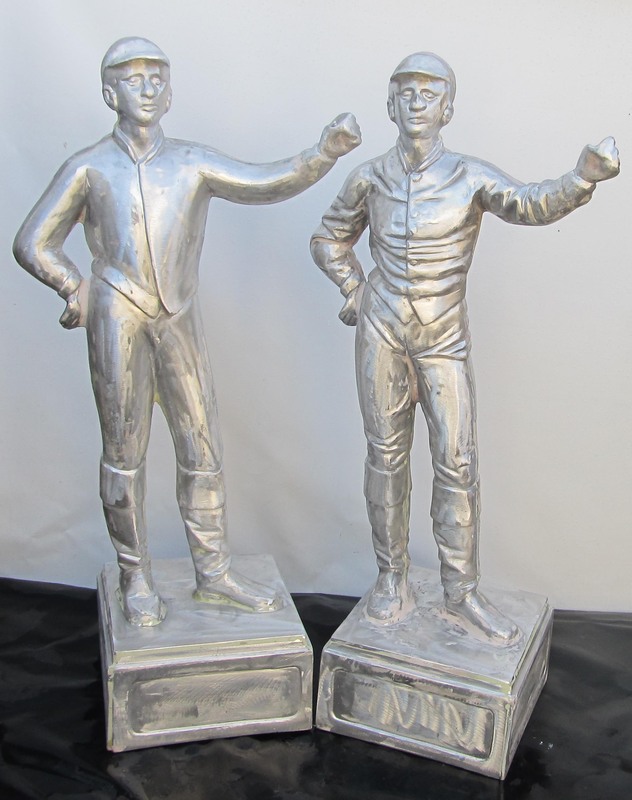 Lawn Jockeys. 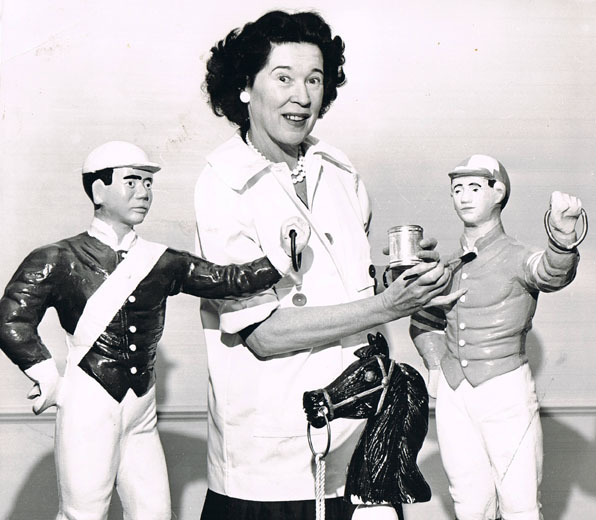 Swim with a dolphin, climb the pyramids, skydive... paint a lawn jockey? 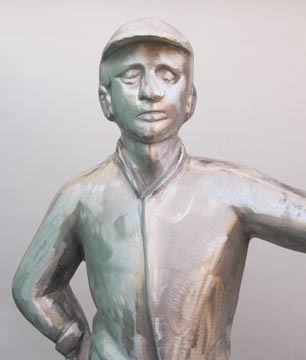 File it under "Things to do before you die"... one of the most frequent comments we get from "unfinished jockey" customers is that custom-painting their own lawn jockey is "something I've always wanted to do". 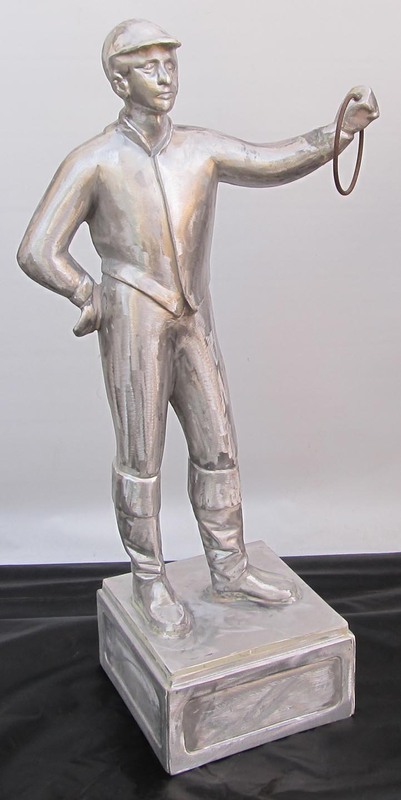 Now is your opportunity to create a unique family heirloom to pass to future generations! Got an specific idea for a Lawn Jock or just want to have some fun with arts and crafts? Here's your chance. Our unfinished jock comes fully assembled as shown below and ready to prime and paint the color and design of your choice. Painting a Lawn Jock is pretty much like painting a car. You can be creative with painting the lawn jockey's clothes, cap, boots, and facial features to your own personal taste. Pro-tip: It's a lot easier when the surface is smooth! Paint it anyway you want - with no wrinkles to get in the way! The CLASSIC WRINKLED version in unfinished, ready-to-paint condition is also available($25 extra). This WRINKLED style is the one we use to paint all our CLASSIC, TRADITIONAL, and PAINT BY NUMBER jocks. 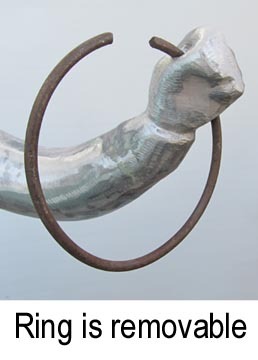 Garden art looks best painted with "heavy" brush strokes for a look that will age gracefully. 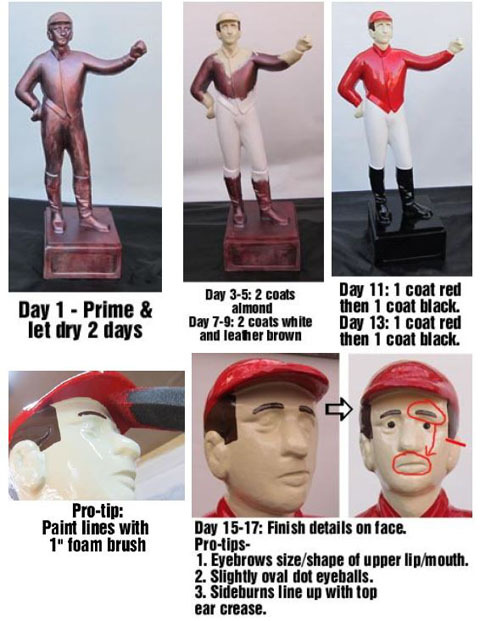 Depending on how complex you want to paint the jock, it takes about 10-21 days of priming, paint-layering and touching up to make a nice looking finished product. 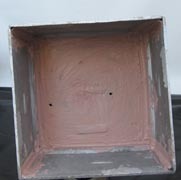 We send painting tips and instructions with each order. Surface preparation is key. 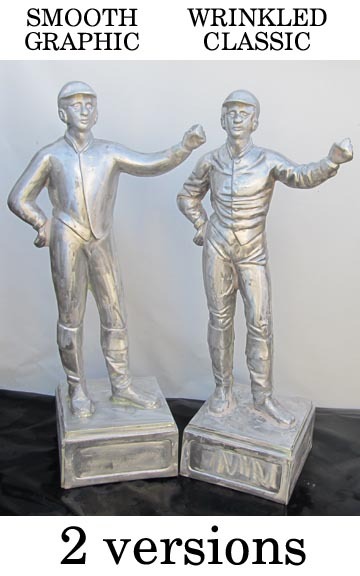 We ship the statues with a clean bare metal and bondo surface. 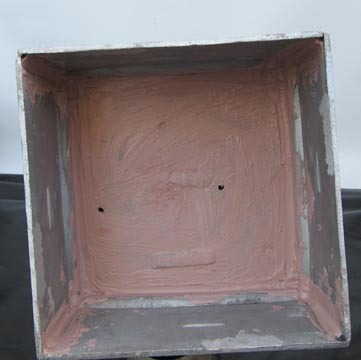 The first task to painting an unfinished jock is to spray on 1 can of primer. Primer color should be close to paint color(white or gray primer for lighter colors, and red or black primer for darker colors). 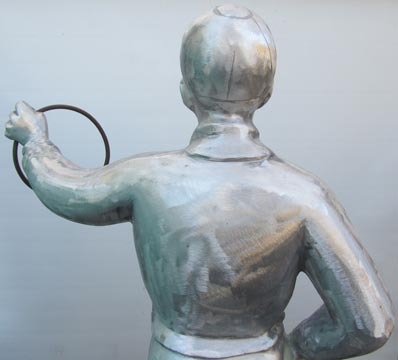 Then slowly paint one area of the statue at a time, repaint, then touch-up... and you will have a very nice, long-lasting paint job. The key for first-timers is to TAKE YOUR TIME and WORK SLOW! Painting a Jock costs over $150 in paint and materials, in addition to about 8 hours of painting and detailing labor. Another option is to buy an semi-custom painted jock or full-custom painted jock. 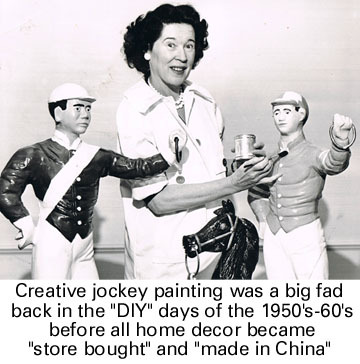 Instead of doing it yourself, you can save time and money by ordering a Custom Jock and let our Lawn Jockey painting experts do all the hard work! A ring is included for the Unfinished Jock's hand, but these Jocks also work well with our optional oil and solar lanterns(lantern sold separately- CLICK HERE for more information). Wrought Aluminium Lawn Jockey Statue on pedestal. Unfinished as shown. Can be painted any color. Includes removable ring for hand and painting instructions. $350 with FREE SHIPPING INCLUDED(to continental U.S. only). WRINKLED VERSION: $375. CLICK HERE for international and Hawaii shipping. 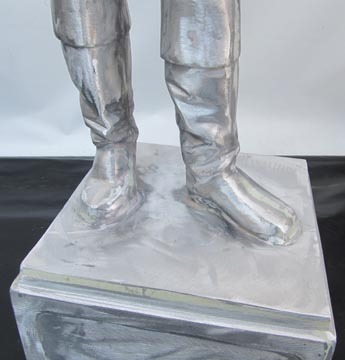 Aluminum doesn't rust, and is lightweight. Unit is hollow. DIMENSIONS: approx. 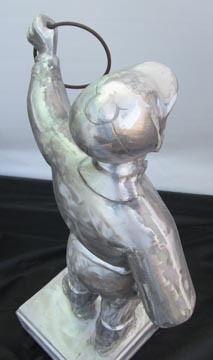 46" tall including pedestal base. Pedestal base is 13" x 13" x 7". Shipping wt. 60 lbs. Arrives fully assembled in a cardboard box by FedEx Ground. Total price: $350. WRINKLED VERSION: $375. Shipping: FREE. MasterCard, Visa, Discover, American Express and paypal accepted. We will send you an email receipt for your payment immediately following order placement. Upon shipment, we will send you an email with package tracking information. Click red "ADD TO CART" button below to order SMOOTH VERSION. Click red "ADD TO CART" button below to order WRINKLED VERSION. For you prefer to order by PHONE rather than order online, CLICK HERE to contact us. For you prefer to send a MONEY ORDER or CHECK rather than order online, CLICK HERE to print an order form with instructions. CLICK HERE for In Stone Terms and Conditions.